Set on four wheels, the Vikron Buffet Cart is as easily used in the kitchen as in the dining room. It can be wheeled to the edge of the table and used as a convenient serving cart, freeing other surfaces. The Vikron Buffet Cart is a piece of furniture when closed, but once opened becomes a great asset for entertaining. 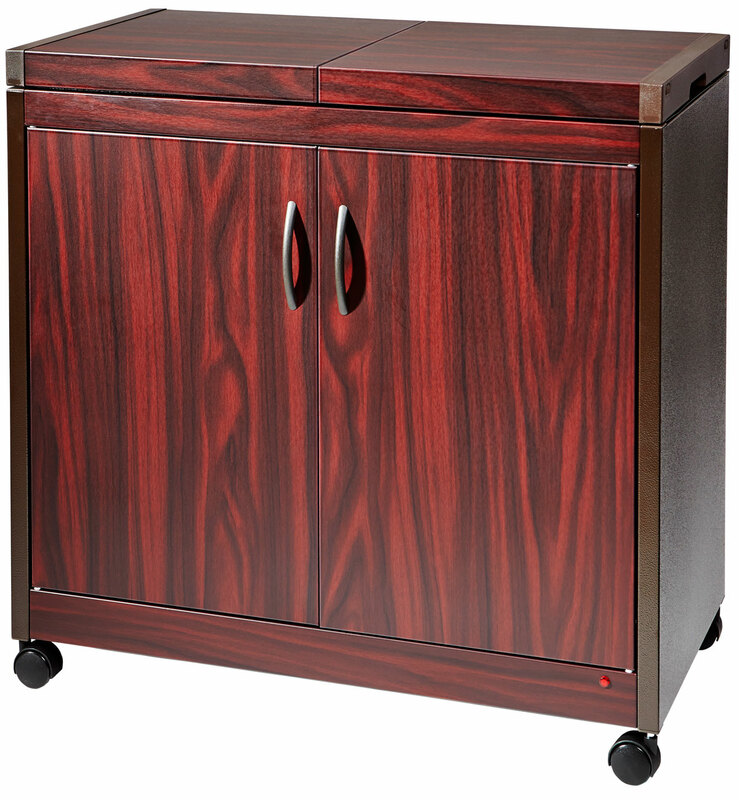 All real wood buffet carts are made from top quality natural woods: oak, pine and mahogany. Using the Buffet Cart, food can be prepared in advance and kept hot for hours without it drying out or becoming tough. This allows the host to dictate when to serve the meal rather than when the food is ready (or just about to burn). Three Pyrex dishes are included with all units and the dish holders are removable allowing the use of any other size dish or platter. The beauty of the Buffet Cart is its simplicity. There are very few moving parts – save for the doors and the sliding top. The heating elements are enclosed within the sheets of galvanized steel that make up the shelves, and the heat is transferred around the unit through basic conduction. Excess heat escapes naturally into the surrounding room. This cooling process means that the Vikron Buffet Cart does not require a built-in thermostat or complex heat-monitoring system. It self regulates between 145°F – 175°F (63°C – 77°C) which is within all recommended safety guidelines for storing cooked foods. (U. S. Food and Drug Administration, Center for Food Safety and Applied Nutrition recommends holding hot foods at or above a minimum of 145°F). All the units are manufactured in the UK and have been converted to UL (file #: E189903) approved 110V. Prices range from $659 for the wood effect units to $1,495 for the real wood finishes, plus shipping and tax (where applicable).